Many of us have visions of retiring to a warm spot and taking it easy, but not Sister Fay Trombley. 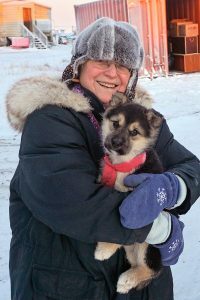 Sr. Fay Trombley, the 77-year-old former professor at Newman Theological College in Edmonton is spending her “retirement” in Tuktoyaktuk, N.W.T., tirelessly working to ease the hunger, unemployment and spiritual needs of people in the Arctic. For that, she is among a select group of individuals honoured with this year’s Polar Medal. She received the honour from Gov. Gen. Julie Payette at a ceremony at Government House in Victoria on March 21. 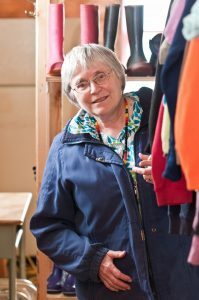 “Sister Fay Trombley collaborated with local community leaders and built a partnership with the Society of Saint Vincent de Paul to address food insecurity in Tuktoyaktuk,” states her citation for the Polar Medal, which honours exceptional contributions to Canada’s North. With help of the St. Vincent de Paul Society in Edmonton, Sister Fay helped start the North of 60 Project in Tuktoyaktuk, a hamlet of 900 people on the Arctic coast. “Tuk” also receives assistance from Food Banks Canada, the Canadian Bible Society, and Catholic Missions in Canada. Born in Powell River, B.C., Sister Fay Trombley entered the Sisters of Charity of the Immaculate Conception in 1956 and later taught school in New Brunswick, Saskatchewan and B.C. She served on the faculty of Newman Theological College from 1983 until retiring in 2005 at age 65. 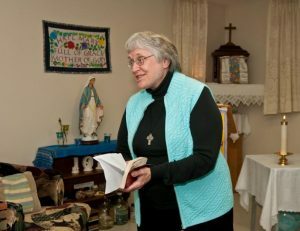 Since then, Sister Fay has been the pastoral leader at Our Lady of Grace mission in Tuktoyaktuk in the Diocese of Mackenzie-Fort Smith, which is twinned with the Edmonton Archdiocese. Sister Fay, congratulations on receiving the Polar Medal. What does this honour mean to you? What comes to me primarily is the layers upon layers of people who are behind projects that help the ministries of the North – and the people who have a whole variety of needs to unfold in a fruitful direction. I think that’s what it means to me: the people behind it. Your work in the North has been a second career for you. Why did you move to the North? Our congregation always said: Retire at a point in your life when you can still prepare yourself for a second career. So I figured when I’m 65, I can still prepare myself. I always wanted to do some missionary work. Basically I had a choice between Peru, where our Sisters were, or the Arctic. Bishop (Denis) Croteau at the time said that he really had needs. I said I’d like to be in one spot so I could get to know the people, and he said, ‘Good. I have nobody for Tuktoyaktuk.’ It was as simple as that. Your mission house, Our Lady of Grace, has become a sort of a community centre. My house isn’t just a place for your own privacy. I have very little privacy. It’s a place where people feel comfortable and welcome. Kids, and people who are dropping in who are tourists sometimes, you never know what’s going to be happening in that house. Food bank. People dropping off stuff for the thrift store. It’s like a community church gathering. What’s the biggest misconception people have of Canada’s North? I would say possibly, still having childhood thoughts of igloos – as I did – and dog teams doing their hunting and fishing, and not realizing what’s a blizzard. How do you survive? Nowadays people don’t have dogs. Dogs could smell open water. The dogs always knew the way home. Not every family has a Ski-Doo, so therefore they can’t get their own meat. Even if you’re going to need a boat and not every family has a boat. So the misconception is they can all more or less equally go get something to eat. You live in an Inuit community. Have you taken up hunting and fishing? Do you know what? I have done a little bit of ice fishing on the Husky Lakes. But could you see me with a gun going out to get a polar bear? I’ve never gone hunting, but I had a beautiful surprise one time. I had gone out on the land – we were actually there to do ice fishing for trout – and this eight-year-old boy was there. All of a sudden he stops dead cold. He’s looking up at the sky – I can’t even see anything – and he starts to make a goose sound. That goose up there turned around and came back in his direction. They know their trade and they pass it on. What are the social and economic challenges in Tuktoyaktuk? I would say the main root of poverty is there’s just no employment. I would say there’s 80 per cent unemployment in Tuktoyaktuk. Young men, especially, have a very hard time. Tourism is not yet developed but it will probably grow. How can the South help? St. Vincent de Paul is probably the main source of help because they are so well organized right across Canada. Even local people who want to come see the Arctic will fill their truck with whatever we say we need. My first vehicle was a Jeep, a standard, so that young men – or not so young men – could learn standard shift and be more ready to work with heavy machinery. For the last three years, that was one of our primary projects. One of the next projects out there, it’s not happened yet, is to get a 40-foot Sea Can (for) three young fellows who are good at carpentry. How can we help them have a place where they can repair furniture or make simple bookshelves or side tables? People have very little in their homes. I already have promise of help and tools and saws, various kinds of equipment. It’s going to work. What are the pastoral needs of Tuktoyaktuk? Up in the Arctic, my experience of church is that from St. James’ Epistle. Halfway through Chapter 2, he talks about what good is it to say to somebody ‘Goodbye and God bless you’ when you’ve got nothing to eat and nothing warm to wear? St. James’ church starts with very basic human needs and requirements of food and clothing. And that’s where I started. When people’s personalities have been crushed because of their ethnicity or residential schools or being absolutely uprooted from a lifestyle that worked for 5,000 years, now they haven’t got that lifestyle anymore … pastoral needs are growing out of those human experiences. Is there a strong faith? What struck me right away when I went to Tuk was that the people have faith. They don’t have a lot of church-going, although they do go to church, but they have faith. They love the Bible. They read the Bible. And they try to live that way. The faith is very visible at funerals. In a town of 900, you could have 200, 300, 400 people at a funeral. The school usually closes in the afternoon when there’s a funeral. They don’t having Bingo the night before or the night of, out of respect. And you can hear a pin drop. The faith is palpable. Mass is celebrated as often as we can get a priest. Most of the priests who are in Inuvik try to get to get to Tuk once every two months, but it’s been longer than that. So it’s a lay-led church. Have the people of Tuktoyaktuk forgiven the Church for residential schools? This takes a long time. But the answer, or at least the partial answer, to what you’re asking is: Listen. Listen to their stories and feel their anger, their pain, their confusion, their loss. The primary listening tool was the (Truth and Reconciliation Commission). But even before TRC, Bishop Croteau had begun a healing project called Return to Spirit. The healing has begun. It’s unfolding. Has the reconciliation happened? I think it’s happening not in a formal way. I kind of represent that. There’s a food bank or there’s a thrift store or maybe “Sister is nice” or the kids really like coming to my house. We have a playground in our yard that we set up in the recent past. These are things that the people from the South are doing for our little community and other communities. It’s breaking down prejudices, making people happy and giving them hope. Always. When I first went to Tuktoyaktuk, I could feel the pain, the resistance, the confusion, the anger of people against church and government and white people, for destroying their way of life. It was just kind of everywhere. They even say, ‘We can’t get our traditional food anymore, so we have to eat white man’s food.’ Do you see? They are growing through their painful experiences. To your vocation, was it a tough decision to join the Sisters of Charity of the Immaculate Conception? We had a Sister in kindergarten and a Sister that taught us to sing and a Sister that took us for walks. Honestly, I think that’s where I got my vocation. It just percolated down there for a long time, and I entered when I was 16. When I had a choice between Peru, where our Sisters were, and the Arctic, I thought, ‘I’ll melt on the streets of Lima’ and I wouldn’t be able to live a peaceful life for my body. I would way rather have the ice and the snow, and the cold and the wind and the dark never did bother me. What’s your advice to young people considering religious life? Keep your ears open. Listen to the Holy Spirit. And listen to your own self. God will be faithful to your own self. Now people do all kinds of things. They go overseas to help people for a summer project or to get to know other cultures. Calls don’t have to be life calls. They can be portions-of-my-life calls. They could be a couple of weeks where I have an experience in a mission, or it could be something that grows into something else. Vocation is a little bit different at this time, but it’s always Gospel. You focus on Jesus. You try to be a disciple of Jesus and listen to the Spirit. It doesn’t have to be like yesterday. What lessons did you learn from teaching at Newman Theological College? I was blessed to be there in the ’80s and ’90s, when pretty well half the student population doing theology were lay people. It was a really good mix, and they challenged one another. It wasn’t just ‘The Church is this or the Church is that.’ The Church is us. Everybody was saying that. I’m always asking myself the question ‘Who are these people who I am with right now? And what do they need?’ The way I find that out is not what I think they should need. It’s where their life is and where they need life and assistance. And that takes a lot of listening. And I first learned to listen at Newman. Is there a third career for Sister Fay? I think this is it! Maybe finally I’ll be able to slow down a little bit, and really have people time instead of project time, to wander through town and visit the elders. Do you ever regret moving to Tuktoyaktuk? Never. It’s home for me. I love it. And I say, ‘God willing, I’ll die there.’ Just find a little spot six feet deep and put me in it.